Student turnout for the Residential Life Debate Watch Party spilled over into a second building. Gina Jensen, adjunct faculty member and director of the Forensic and Debate program, was interviewed on NBC affiliate KSDK channel 5 Monday night before the presidential debate. They asked her what tacticts Hillary Clinton and Donald Trump would have to employ in order to “win” the debate. Separately, Jessica Karins, news editor of The Journal, was quoted in USA Today about the reaction of Webster students had to the first presidential debate. 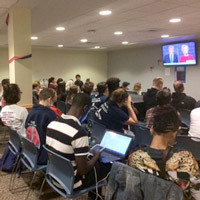 A photo of the standing-room only Housing and Residential Life debate watch party in West Hall was included in the story. Sociology and criminology professor Remy Cross was part of the Sept. 23 live airing of "St. Louis On The Air," in which host Don Marsh discussed the effect of "See Something, Say Something" counterterrorism campaigns. During the show, Ross "warned that “see something, say something” campaigns are a visual way to reassure people that something is being done, but they aren’t particularly effective." “Remember that terrorism is a vanishingly rare occurrence,” Cross said. “The vast majority of Americans will never experience a terrorism threat in their life. Beyond that, terrorism thrives on ignorance. Hear a replay and read a recap at St. Louis Public Radio. Sheetal Shah, head of the Department of Behavioral and Social Sciences at Webster University the Netherlands, penned "The Psychology Behind Brexit, Trump and Wilders" on the underlying psychology of political movements in response to fear, terrorism and xenophobia, among other factors. The article appears in IAmExpat, the largest expatriate portal and community in the Netherlands. Robert Barnidge, visiting assistant professor, History, Politics, and International Relations, penned a guest column in The Washington Times, "The End of Ideology? Words Have No Meaning if Islamic Terror is Simply Garden-Variety Violence," on the religious ideological roots of recent acts of terrorism and the words Pope Francis has used to characterize them.